25 Words or Less…Can You Do It? I read an article years back that proposed that a breed could be described succinctly in 25 words or less. If you had to describe the Polish Lowland Sheepdog to an intelligent but non-dog oriented individual what words would you use? Let’s say that this person is a judge of horses, but not a judge of dogs. Or, let’s say that you are approached at a dog show by a prospective judge and asked to describe the breed, would you be able to convey the essence of the Polish Lowland in 25 words or less? Now, section by section, select key phrases or words that you feel are most important in describing the Polish Lowland. For this exercise we will grant as “freebies” any articles (“a”, “the”, “an”, etc) and any conjunctions (“and”, “but”, “or”, etc.). Most likely you will have more than 25 words! Now, go through each of those sections again and look at those words and choose only those that you feel are the absolute essentials. Is it possible to describe the breed in only 25 words? It may be difficult for some, but it is possible and VERY educational! Ch. 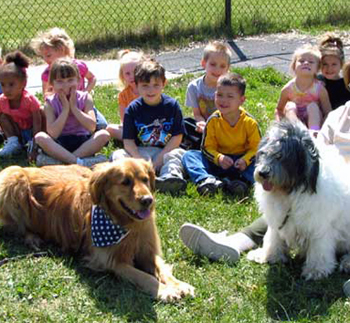 Czaber z Wielgowa - "Zoom" to his friends, with the kids from the Jasper County, Indiana Head Start program doing a presentation on Dog Safety for children.